The message from Benedict XVI for the centenary of the birth of the Blessed was read this morning by Mgr. Lucas Sirkar during mass celebrated in the chapel of the Motherhouse of the Missionaries of Charity in Calcutta. 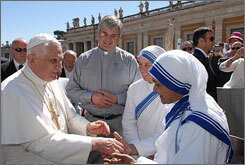 Kolkata (AsiaNews) – Marking the special year that begins today for the centenary of the birth of Mother Teresa of Calcutta, Pope Benedict XVI "joins himself spiritually" to the celebrations and expresses confidence that it will allow "the Church and the world" to " joyful gratitude to God for the inestimable gift that Mother Teresa was in her lifetime".